Set amid the Ponderosa pine trees at Fort Tuthill County Park, Fort Tuthill Bike Park originated with a community desire to have a gathering place where people could practice their mountain biking skills. The Bike Park currently offers flow trails (beginner, intermediate and advanced), a tot track, and a return trail available for riders. Park hours are dawn to dusk, and is free to the public. We'll be monitoring the Bike Park daily and will be closing it due to inclement weather, so keep checking our Fort Tuthill Bike Park Facebook Page for park updates and our Volunteer Page for upcoming volunteer training dates. 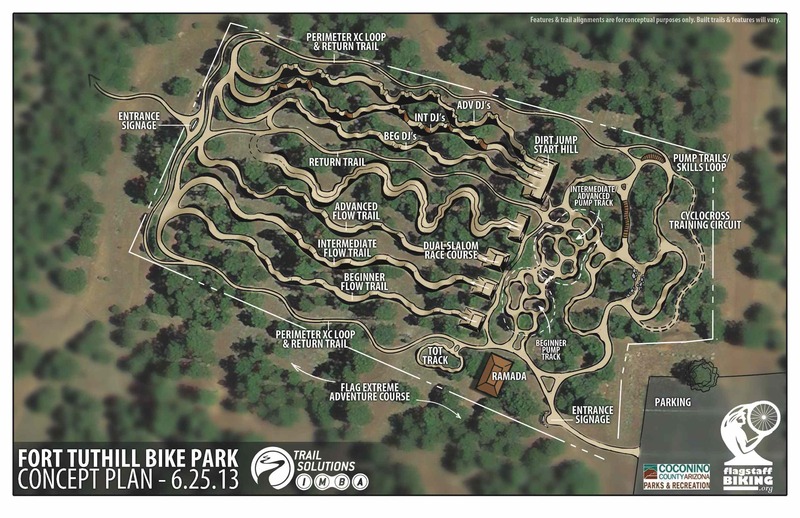 Fort Tuthill Bike Park is a state-of-art, fully-featured mountain bike skills park. A partnership agreement in 2013 between Flagstaff Biking Organization (FBO) and Coconino County Parks and Recreation allowed FBO to go forward with fundraising for the Bike Park. Once funds were secured, construction of Phase 1 began in October 2014 on this seven-acre facility and IMBA Trail Solutions supplied the park design. FBO continues to raise funds for Phase 2 of the Bike Park, which will have new, additional features. Coconino County Parks and Recreation manages the Bike Park with many volunteers contributing their time and energy. Thanks to FBO and the support of the local cycling community, Fort Tuthill Bike Park was one of the three winners to split the 2014 Bell Built Grants: $100,000 in technical assistance money to be split among three projects built by IMBA. This grant money, along with public donations, helped to fund Phase 1 construction of Fort Tuthill Bike Park. Fort Tuthill Bike Park was one of six parks across the country to be featured on National Recreation and Park Association's crowdfunding site, Fund Your Park, in December 2014. Thank you to everyone who donated to the Fort Tuthill Bike Park! Visit Flagstaff Biking Organization for more ways you can help with the park's next development phase. The concept plan designed in 2013 shows its location in Fort Tuthill County Park directly north of Flagstaff Extreme Adventure Course. Once construction is finished, there are plans of building a ramada as well as public bathrooms at the entrance of the bike park. The goal is to create a bike park for the whole community of bicyclists to enjoy, no matter what skill level. Improve your bike skills at Fort Tuthill Bike Park and then explore the surrounding mountain biking trails in Coconino County! The bike park will consist of beginner, intermediate and advanced trails with a wide array of progressive features to appeal to all levels of bike riders. The bike park is a non-supervised facility. Biking is a hazardous recreational activity. Helmets and protective gear are strongly recommended. The park is available to both experienced and inexperienced bikers. The Skills Park is subject to closure due to maintenance activities or adverse weather conditions. Riding on the course when extremely wet causes damages to park features. Stay on defined trail surfaces and do not "free ride" into the landscape. Features are rated as shown on the Trial Difficulty Rating System and marked on the course. It is your responsibility to know the trail rating and ride within your skill level. The Skills Park contains numerous constructed jumps, ramps, embankments and terrain variations known as "features". The features vary in difficulty and change constantly due to conditions, weather, usage, grooming and time of day. It is your responsibility to inspect these features before you use them and throughout the day. You control the degree of risk you will encounter in using these features. Your speed and takeoff will directly affect your air borne maneuvering and landing. DO not attempt to ride these features unless you have sufficient ability and experience to do so safely. Look for small features to begin with and work your way up to larger features. Freestyle skills require maintaining control on the ground and in the air and are required for all features in the Skills Park. Only one person may use a feature at a time. Do not jump blindly and always use spotters. LOOK BEFORE YOU LEAP! Always clear the landing area quickly. Always ride in control and within your ability level. Observe all signs and warnings and stay off closed features. No unauthorized building or modification of features. Consumption of alcohol in the bike park is forbidden. Riding while intoxicated is dangerous for both you and the other riders. If riding alone, possession of a cell phone in case of emergencies is recommended. Coconino County does not assume responsibility for injuries. Use this facility at your own risk. Please report all violation of the Bike Park Rules or unsafe conditions to 928-679-8000.
project. Construction of Phase 1 began on October 27, 2014. Phase 1, which includes the construction of beginner, intermediate and advanced flow trails, a tot track, and return trail, finished in December 2014. We celebrated the Grand Opening of the Bike Park in June 2015. Phase 2 work with new skills and features were opened to the public in spring 2017. Construction of the remainder of Phase 2 and beginning of Phase 3 began in August 2018.